Beating up others – in violent riots, or violent social media posts, all because others believe differently than you … well, this is the height of social immaturity. May those who call themselves by the name of Christ be grown-ups, so the world can know what a grown-up looks like, and where to turn to find them. I saw a disturbing video, and could hardly believe it. 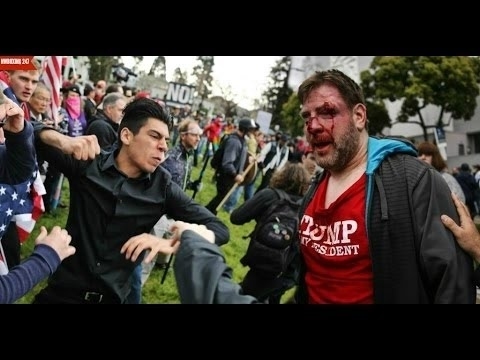 A group of “Antifa” protesters beating up on a “Say No to Hate” rally. Beneath the Facebook post of the video were a number of comments about the rightness and (mostly) wrongness of these kinds of actions. It dawned on me: As a populace, we are very weak and immature. Which is why we fight so much. This according to the Apostle Paul. One of Paul’s major themes in the New Testament is how we should handle our deepest convictions. Paul acknowledges that we all have them, and they are often different. Example: “For us there is one God, the Father, from whom are all things and for whom we exist, and one Lord, Jesus Christ, through whom are all things and through whom we exist. However, not all possess this knowledge“ (1 Cor. 8:6-7). The Bible says that knowledge about God and the spiritual world is God-given. Not all have it, therefore not all believe the basics. So, how do we handle having this knowledge when other’s don’t? “We know that ‘all of us possess knowledge.’ This ‘knowledge’ puffs up, but love builds up. If anyone imagines that he knows something, he does not yet know as he ought to know” (1 Cor. 8:1-3). ‘All things are lawful,’ but not all things are helpful. ‘All things are lawful,’ but not all things build up. Let no one seek his own good, but the good of his neighbor” (1 Cor. 10:23). “I have made myself a servant to all, that I might win more of them … to those outside the law I became as one outside the law that I might win those outside the law. To the weak I became weak, that I might win the weak. I have become all things to all people, that by all means I might save some. I do it all for the sake of the gospel, that I may share with them in its blessings” (1 Cor. 9:19-23). When it comes to the believer’s relationship with the world, it’s not about loving how right we think we are, then insisting that the world become like us. Rather, we become like them in order to love them, honor them, serve them. And hopefully during that interaction God gives them ears to hear and eyes to see … and are saved. “As for the one who is weak, welcome him, but not to quarrel over opinions. One person believes [one thing] while the weak person [another]. Let not the one despise the one … and let not the one … pass judgment on the [other]. Who are you to pass judgment on the servant of another? It is before his own master that he stands or falls … Each one should be fully convinced in his own mind … For we will all stand before the judgment seat of God … each of us will give an account of himself to God” (sel. fr. Rom. 14). Welcome them. Be fully convinced, that’s fine … but don’t quarrel over opinions. Just don’t! And certainly don’t despise or pass judgment. “So, whether you eat or drink, or whatever you do, do all to the glory of God. Give no offense to Jews or to Greeks or to the church of God, just as I try to please everyone in everything I do, not seeking my own advantage, but that of many, that they may be saved” (1 Cor. 10:23-33). Give no offense! Try to please everyone. Because the issue isn’t who’s right. The issue is what will helps promote the truth, and salvation. CONCLUSION: When we have sharp disagreements, mature people have the capacity to love their neighbor rather than insist on their own correctness. Mature people keep the bigger picture in view, not the heat of the momentary issue. Mature people humble themselves by crawling into the existence of the other — doing all they can to understand their hearts and minds — so that love will prevail over our contention.